Review: This Was Burlesque | Oh, The Glamourous Life! The highlight of the costume exhibit I’m curating at the West End Museum is several costumes worn by Ann Corio in her show This Was Burlesque, courtesy of her niece. In preparation for creating wall text, I’ve been rereading the book that accompanied the show. It seemed like high time to review it. A special thanks to my friends Teresa & Jeff who gave us this autographed copy one New Year’s Eve. 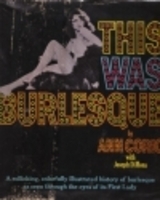 This Was Burlesque by Ann Corio (1968). Ann Corio was one of the biggest burlesque stars in the Golden Age of Burlesque, especially in Boston. She played the Old Howard frequently and was much beloved of Harvard students. She claimed other colleges referred to her as “Harvard’s baby”, but she was definitely known as “Her Majesty, The Queen”. After her career in burlesque she turned to acting on stage and in B-movies, but just couldn’t forget about burlesque. In 1962 she and her partner Michael Iannucci opened This Was Burlesque in New York City. A retrospective of comedy, striptease, and chorus girls, it ultimately played all over the country for almost 30 years. It was filmed by HBO in the 70’s, but the VHS tapes are hard to find. Fortunately, we have Miss Corio’s book. She writes a light history of burlesque as one who was there through most of it. She perpetuates some burlesque myths and creates some new ones, but this is hardly an academic tome. She presented burlesque as cleanly and gently as possible to an audience who wanted something a little naughty, but not too threatening. The book is illustrated with photographs from her show and as well as historical burlesque performances. There’s a strong emphasis on comics, especially ones who started in burlesque and went on to fame in film and television. She includes a number of scripts for comic sketches. The book is out of print, but can be found at used book dealers without too much difficulty.